Focus Audio, of Ontario, has been in business since 1993, and is one of the well-respected names of Canadian audio. Their speaker range tends toward the high end, with lines such as the Prestige and the Master series soaring to $10,000/pair and above. Over the years, Focus speakers have been reviewed favorably in Home Theater & Sound and our sister publications. When their Classic series was introduced at the 2009 Consumer Electronics Show, all of our writers who heard the system raved about its sound. And when I heard that the top Classic model, the FC 9, cost less than $2000/pair, I was excited at the prospect of reviewing a Classic system assembled for home-theater use. The system reviewed here is based on the FC 8 tower speaker, the second from the top of the Classic line ($1800 per pair). Rounding out the system are the FCC 2 center-channel speaker ($680) and the FC 6 bookshelf model ($1000/pair), the last used as surrounds. At a system price of $3480, the Classic gives a taste of Focuss higher-end models at a fraction of the cost. The Classic FC 8 is an elegant floorstanding loudspeaker. Only 38"H x 7.5"W x 10"D, its easy to move around to different positions. The cabinet is of 2"-thick MDF covered in a veneer of reddish-brown rosewood, as are all Classic models (dark rosewood is also available). The smooth matte veneer is gorgeous, and a big step up from the laminate oak normally seen in this price range. Rather than a simple rectilinear box, the FC 8 has tapered edges that not only add to its visual appeal, but are also functional in reducing the baffle area around the drivers. This minimizes the diffraction of soundwaves by the cabinet, which can color the sound emanating from the drivers: a 1" tweeter and two 5.5" woofers. A wooden base gives stability, and around back, about a foot above the base, is a 2"-diameter port. Two pairs of five-way binding posts, suitable for biwiring or biamping, are located unusually high on the rear. With a claimed sensitivity of 91dB/W/m, the FC 8 proved an easy load for my Integra DTR-8.8 A/V receiver. I found that the FC 8s removable grilles came off too easily. This might have been because my review samples were demo units that had been used at CES, where people were constantly removing and replacing the grilles to look at the drivers. In any case, it would have been nice to have had tighter posts. The matching FCC 2 center-channel speaker has the standard, horizontal woofer-tweeter-woofer array seen in the vast majority of center channels: two 5.5" woofers flanking a central 1" tweeter. The cabinet of solid MDF has the same sort of tapered edges as the FC 8, as well as the towers 2" rear port and pairs of five-way binding posts. With dimensions of 22.5"W x 7.5"H x 10"D, the FCC 2 is well proportioned, and was easy to fit under my 92" projection screen. And with a claimed sensitivity of 91dB/W/m, the same as the FC 8, the FCC 2 was also easily accommodated by my Integra receiver. The FC 6, the Classic lines bookshelf model, is also usable as a surround speaker. Its 1" tweeter sits above a single 5.5" woofer. With dimensions of 14"H x 7.5"W x 10"D, the FC 6 is a bit bigger than average for a bookshelf. Around back are the biampable binding posts, along with a 2"-wide port behind the tweeter. The speakers claimed sensitivity of 86dB/W/m screams "Demanding load!" For surround duties, though, they seemed up to the task of easily reproducing ambient and discrete sounds as driven by my receiver. The beauty of the Classic system is that all three speakers use the same drive-units: a 1" ring-radiator tweeter and one or two 5.5" Nomex woofers. This means theres a higher likelihood that the speakers will tonally match each other. Focus Audio doesnt make its own drivers; instead, they buy them from Tymphany, a well-respected driver manufacturer in Denmark and makers of the Peerless and Vifa brands. To ensure the high quality of the Classic models, Focus Audio told me that they use the same design process as in their flagship Master line, making careful compromises in the selection of each part. The 1" ring-radiator tweeter is unusual. In profile it looks much like an advanced woofer design, with a central, bullet-shaped waveguide plug that helps keep its output consistent both on and off axis. Like a conventional dome tweeter, a ring-radiator tweeter is supported on its outer edge; the difference is that its also supported on its inner edge. This results in more precise movement of the radiating surface. According to Focus, this tweeter was chosen for its smooth high-frequency response up to 40kHz. The cone of the 5.5" midrange/woofer is made of Nomex, a type of nylon formed into a fiber paper, and chosen for its stiffness and damping characteristics. The result, according to Focus, is excellent transient response without harshness, aided by a large voice-coil that can handle large amounts of power. I set up the Classic speakers in the usual spots in my room, with the left, center, and right front speakers about 9 from my listening seat. The FC 8s were 3 from the front wall and 4 from the sidewalls, positions I preferred because this rear-ported speaker could sound "fat" if placed too close to a wall, and because, in my room, soundstages are wider and deeper when the mains are set up this way. The FCC 2 center sat atop my low equipment stand, below the screen, and the FC 6 surrounds were about 5 away from and slightly behind the listening position. Focus Audio doesnt make subwoofers, but I had a few on hand, which I swapped in and out of the system. For most of my listening I used a Paradigm UltraCube 12, which nicely matches the size of the Focus Audio system. Toward the end of the review period I also tried Axiom Audios massive EP800 subwoofer, but at 4 tall, it dwarfed the Focus FC 8s. My first impression of the Classic system was of its sheer musicality. Every multichannel music track I threw at it was so involving, drawing me into listening to song after song. One disc that sounded particularly impressive through the system was Ladysmith Black Mambazos Long Walk to Freedom, which features such guest vocalists as Melissa Etheridge, Emmylou Harris, and Sarah McLachlan (SACD/CD, Heads Up HUSA 9109). Most tracks are sung a cappella; the voices were rich in each channel, with the surrounds particularly prominent. The front soundstage of "Nomathemba" was particularly impressive -- a seamless wall of sound was spread out before me. With "Homeless," it was easy to pick out Sarah McLachlan in the left surround speaker. There are many vocal sound effects that are swept from the left surround speaker to the right, and it was easy to track these behind me through the FC 6 surrounds due to the systems impressive imaging -- the sounds faded out well to the outside of the right surround speaker. The high frequencies were especially well served, sounding sweet with no hint of harshness. In "How Long," voices were easily passed from center-channel to main to surround speaker. The FC 6 surrounds and FCC 2 center were such a precise match that the experience was breathtaking. Ive never heard such an engaging set of speakers for multichannel music in this price range. The Focus Audio system proved just as engaging with movies. The Blu-ray edition of The Dark Knight has a reference-quality Dolby TrueHD soundtrack, with all channels prominent throughout much of the film. In chapter 2, shell casings drop to the concrete floor of a parking garage. These sounded far to the right of the right FC 8 speaker, a testament to the imaging prowess of this system. The sound of the casings hitting the concrete was a touch softer than Im used to hearing, however. In chapter 11, a helicopter flies across the front of the soundstage -- the movement of the sound from the left FC 8 to the FCC 2 to the right FC 8 was smooth, with no obvious shifts in tonality from speaker to speaker to change the color of the sound and call my attention to the fact that it was being produced by three separate loudspeakers. In chapter 9 of The Dark Knight, as Batman glides from the top of a building in Hong Kong, the sound begins in the rear speakers and moves to the center channel. This effect revealed the Classic speakers perfect timbral match -- not surprising, as the same drivers are used in all three models, but still an indication of how well this system has been designed. Even though the FCC 2s and FC 6s driver complements are identical, the orientation of those drivers are different; its tricky to get the crossovers just right. Dialog was easy to understand through the FCC 2 -- I never had to strain to understand what was being said. This is especially important in The Dark Knight; Batman speaks breathily to conceal his true identity, and can be difficult to understand through inferior center-channel speakers. Male voices, however, had a bit of chestiness through the FCC 2, indicating an upper-bass emphasis. Moving off axis also created a high-frequency rolloff, a trait common among center speakers with horizontal driver arrays. In the past, Ive strongly preferred multipolar surround speakers, whether dipole or bipole; to me, they represent the best compromise in the simultaneous reproduction of diffuse and discrete effects. I still prefer those types of surround speakers, but good bookshelf designs such as the FC 6 challenge my bias. With their wide dispersion, the FC 6es, working as side surrounds, so well handled the imaging that I heard a wall-of-sound effect behind me. This is especially important when a soundtrack is trying to convey a sense of space, as of Bruce Waynes temporary hideout under a shipping container in chapter 3 of The Dark Knight. I had on hand a comparably priced tower-based surround system: Paradigms Monitor 11 v.6 tower ($1498/pair), Monitor CC-390 v.6 center ($699), and Monitor ADP-390 v.6 surround ($898/pair). At a system price of $3095 -- $385 less than the Focus Audios -- and having been named a Reviewers Choice by Home Theater & Sound, the Paradigms are a natural rival to the Classic system. Which is better? I know you dont want to hear this, but it depends on what you value. The differences between the two systems were very small and somewhat difficult to pinpoint. In a nutshell, for listening to music, whether in two or five channels, I preferred the Focus Audio system. For watching movies, I preferred the Paradigms. You might say that sound is sound, and that a speaker that excels at accurately reproducing one sort of sound should excel in the reproduction of all sorts of sound. However, I believe that some speakers have subtle performance attributes that make them more suited to the reproduction of the sounds of movies or music. For example, I raved about the Paradigm Monitor CC-390 v.6 center speaker, and those ravings stood up when I compared it with the Focus Audio Classic FCC 2 center. Although I never had to strain to hear dialog through the FCC 2, throughout The Dark Knight Morgan Freemans and Christian Bales voices had a hint of boxiness and chestiness, and I was always aware of where their voices were coming from. This was not at all evident with the Paradigm CC-390 v.6. As well, a high-frequency rolloff was apparent off axis with the FCC 2, but not with the CC-390 v.6. However, fans of multichannel music might not even notice this about the FCC 2, as listening to music is often a solitary activity. Someone listening to music alone would probably sit in the sweet spot, directly in front of the center speaker. And without the constraints of a home-theater screen or TV, the center speaker can be placed higher or more optimally than I could in my home theater. For multichannel music, I found the Focus Audio system more engaging. Thats not to say that the Paradigm Monitors were slouches at imaging, high-frequency air, or midrange naturalness -- they did all this well. But the Monitors sounded a bit forward in comparison with the relaxed sound of the Classics. This made the Focus system more pleasant for listening to acoustic piano and female voices, such as Diana Kralls on her Look of Love (SACD/CD, Verve 314 589 507-2). Listening to this album through the Classics, I wanted to stay and listen to the entire disc -- something I didnt experience with the Monitors. 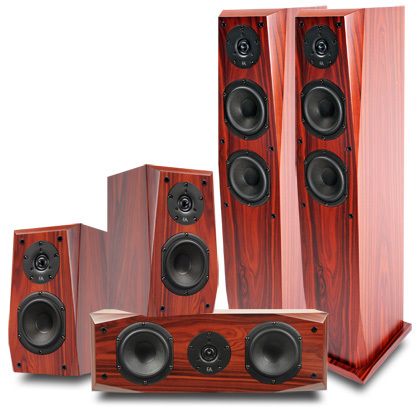 Paradigms Monitor ADP-390 v.6 surround speaker edged out the Classic FC 6 surround in terms of envelopment. As I said above, the FC 6es imaged behind me like pros due to their wide-dispersion design, while the ADP-390s came into their own toward the sides of the room. So rather than the separate front and rear soundstages I heard with the Focus Audio system, the Paradigms enveloped me in seamless surround sound. This was especially effective with The Dark Knights many different sonic atmospheres, such as the police interrogation room and Bruce Waynes hideout. Focus Audios Classic array of FC 8 towers, FCC 2 center, and FC 6 surrounds is a high-performing surround system that excels across the board -- but especially for listening to music. It kept me mesmerized for hours, and in this regard challenged systems well above it in price. It was easy to place and live with, with ideal physical proportions well suited to rooms of small and medium size. If you listen more to music, whether to two- or multichannel recordings, than you watch movies, I urge you to give this system a listen. Because music is where it truly excels. All contents copyright ?Schneider Publishing Inc., all rights reserved.